It was a cool, calm summers evening, I had had a stressful day at work and the last thing I wanted to do was think about cooking dinner. Lucky for me, I had been invited to head down to The New Club at the bottom of Preston Street to try out the gluten free options they have on their menu, and it was the perfect treat. 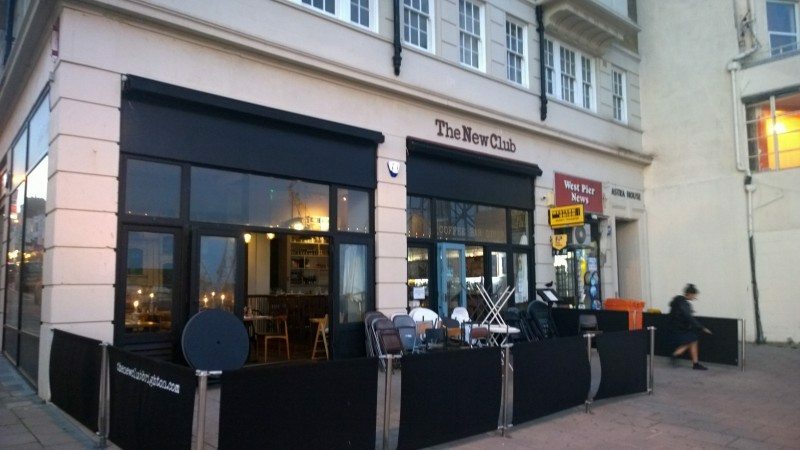 The New Club was established a couple of years ago, in half of the old China Garden building, in a prime spot on the seafront. It has thus far impressed Brighton foodies, and foodies from afar, with their fresh and creative dishes, outstanding burgers, innovative cocktails (bacon infused vodka bloody mary’s… I know), and trendy and unique furnishings. 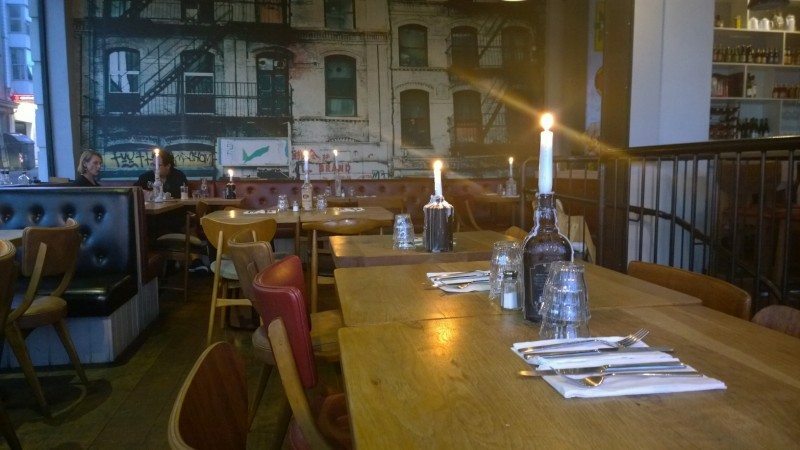 They specialise in fresh and innovative dishes, with a regularly changing menu, served in a casual environment that is suitable for all types of customers, whether it’s families, groups, couples or teens. The restaurant is decked out with New York style pictures, retro seats, candle lit tables and outdoor seating as well. 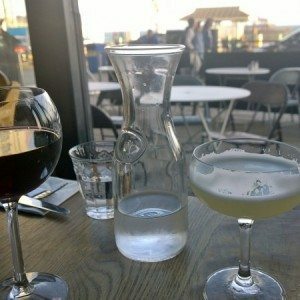 It’s great location on the seafront means it’s a fantastic place for people watching, sunset viewing, or enjoying a tasty cocktail with dishes to share in the sun. When we arrived we were sat next to the large, open front windows and given the drinks list to look through, and our waitress went through the menu for me to explain which dishes are able to be made gluten free. With a lot of tasty choices, I was really looking forward to our food. We ordered our drinks and they arrived shortly after – I went for the cocktail of the day and my partner decided on a light red wine. My cocktail was made from Brokers London Dry Gin, Cucumber, Lemon, Sugar and Absythne Spritz and it was beautifully summery and refreshing. It basically had all of my favourite things in a drink and it was strong so I was very happy sipping away after my busy day. My partner chose the Cotes De Rhone from the short but excellent wine list, and it was nice and light and we both enjoyed the unique wine glass it was served in. They also serve a range of craft beers in schooners, and you can order your wine by the carafe if a bottle is going to be too much. The New Club change their menu regularly, but always try and have options for people with food intolerances and allergies, so do let them know when you book or dine in. The menu that we had on the day had a good range of options that did not have gluten containing or ingredients or that could be adapted – including 2 starters, 4 mains and three sides, so not bad at all. Their menu is divided into snacks/or to share, and plates so it if there are a few of you, it’s nice to get a few things for sharing. They also use Sussex Bread Co as their gluten free bread supplier who I love – they recently won an International award for their burger buns as the best gluten free buns in the world! 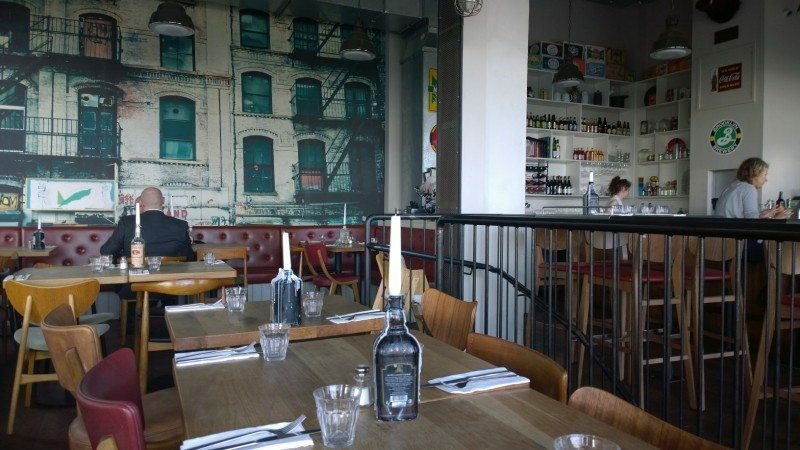 So if you are into burgers, then I would definitely recommend adding The New Club to your gluten free burger places in Brighton to visit list. 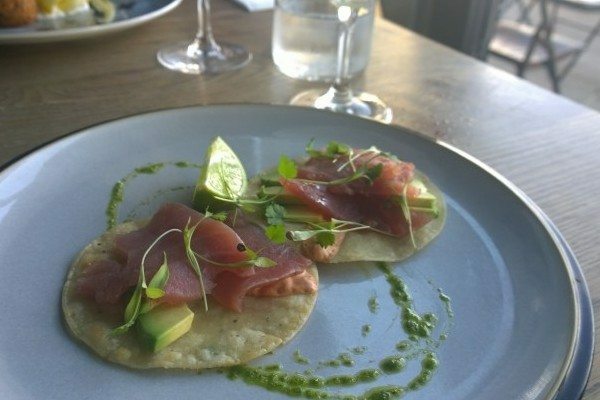 I went for the Sashimi Grade Tuna Tostados with Lime, Avocado, Smoked Chipotle and Crispy Leeks without the crispy leeks to make it gluten free. There was a bright green basil oil drizzled underneath that added a lovely freshness to the dish. 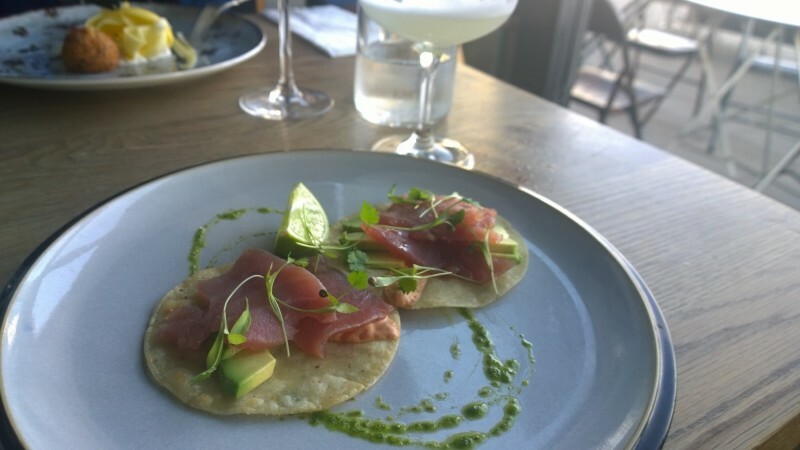 The tostados were more like soft corn tacos, but it meant that I was able to eat them with my hands, and the combination of the tuna and avocado and slightly spiced mayonnaise worked really well together. I think the crispy leeks would have added a nice texture to them, but I still really enjoyed it nonetheless. The fish was really fresh and the avocado was a light lime green and creamy. Once our plates were cleared it was not long after that our mains arrived. I ordered the Ground Spice BBQ Lamb Rump with Sweet Potato Shoe String Fries, Sweet Bell Pepper, Cucumber and Pineapple Relish w/ a Hint of Chilli and a Coriander Salsa Verde; and my partner went for the non gluten free Trio of Grilled New Season Lobster in House Baked Brioche, Garlic and Chive Mayo, Chilli Caramel Butter, Triple Cooked Truffle Chips w Parmesan. My lamb was tender and really mild, not really strong like some lamb can be. 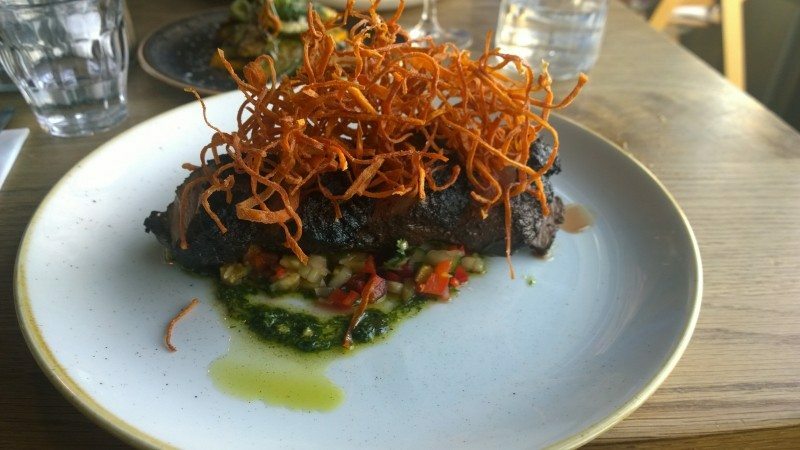 There was no need for a steak knife even though I was offered one, and the spices it was coated in were just right – not overpowering. My partner kept stealing my sweet potato shoe string fries on top as they were so good, and they added a nice crunch to the rest of the ingredients, I really like the balance of fresh, smokey and crunchy on the plate. My partners lobster sliders were the star of the evening, he was very impressed! 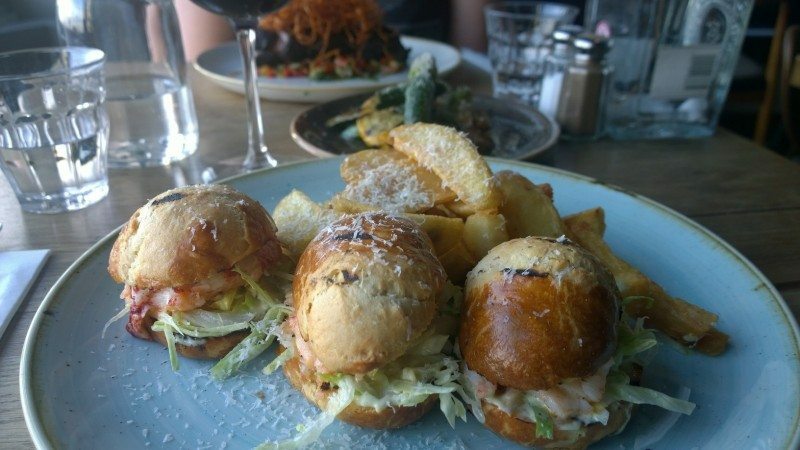 The brioche buns were soft and obviously home made, the lobster was fresh and plentiful and the truffled chips were crunchy and flavoursome – I kept stealing these as pay back for him stealing my sweet potato shoe string fries. 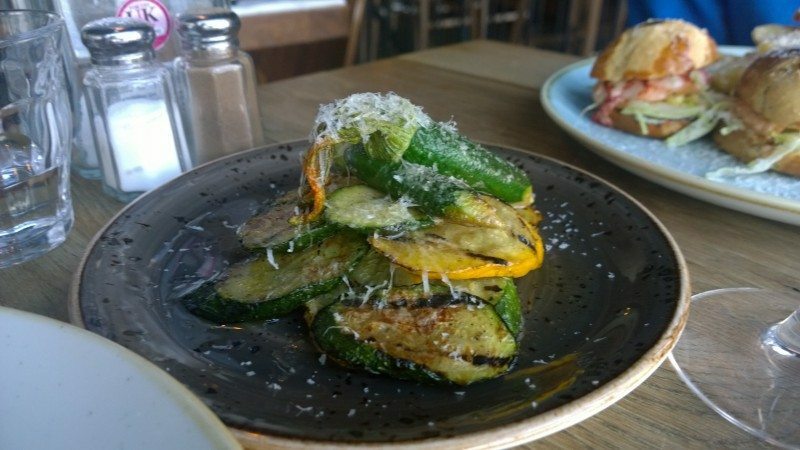 We also shared a side of the Grilled Summer Courgettes with Punchy Garlic Oil and Fine Parmesan – again, my partner was reluctant to order these, but he really enjoyed them, they were soft, sweet, and full of flavour – you can tell they are ordered from a good quality vegetable supplier. What we really enjoyed about the food is it didn’t come in massive portions, and everything was carefully prepared and presented so we really savoured every mouthfeel. It was fine dining quality in a casual environment. Now usually we struggle to fit dessert, however today we were both feeling indulgent and when we were offered the menu we couldn’t say no. There are just a couple of items that are gluten free, one of them being the Flourless Salted Chocolate Brownie with Maple Clotted Cream which I decided to go for. 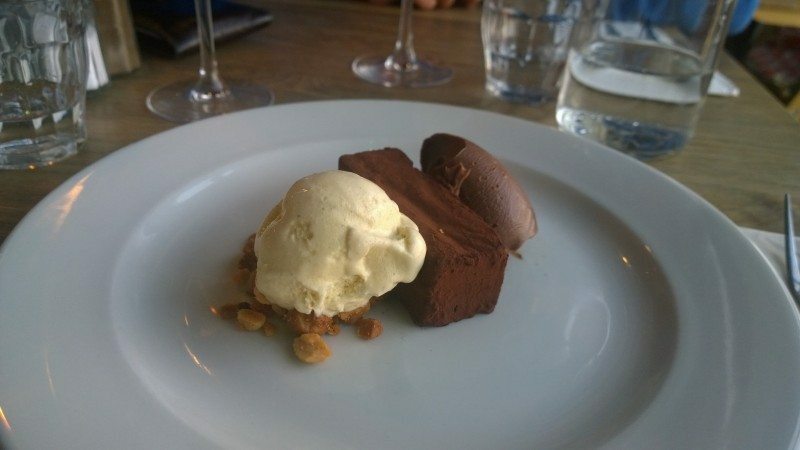 They were out of clotted cream that evening so mine came served with Ice Cream, Peanuts and Chocolate Ganache instead. The ice cream, I was told may have traces of gluten, for me I am lucky to just have an intolerance, so that was okay, but something to keep in mind if your condition is more serious. My partner went for the home made ice cream – that evening he had a choice of caramel, vanilla and black cherry and the caramel won this time. The brownie was packed with dates and nuts and tasted similar to health food brownies I have bought in the past. I couldn’t pick up the saltiness, but it was nice and sweet and nutty. Maybe not one that brownie traditionalists would go for, I don’t know? 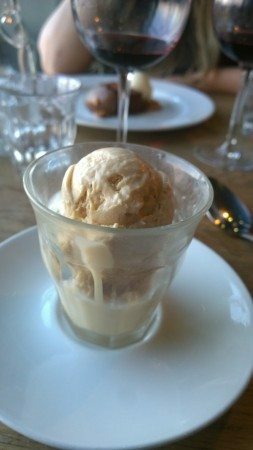 My partner enjoyed his caramel ice cream – packed full of flavour, rich and creamy. Overall I think The New Club has a good number of options for gluten intolerant’s- their menu isn’t labelled so do make sure you let the wait staff know when ordering, or when you make the booking ideally and they are more than happy to assist you. Our waitress was very good at explaining to me which dishes were compatible when we sat down, and if given notice, I get the feeling they would go out of their way to look after you. 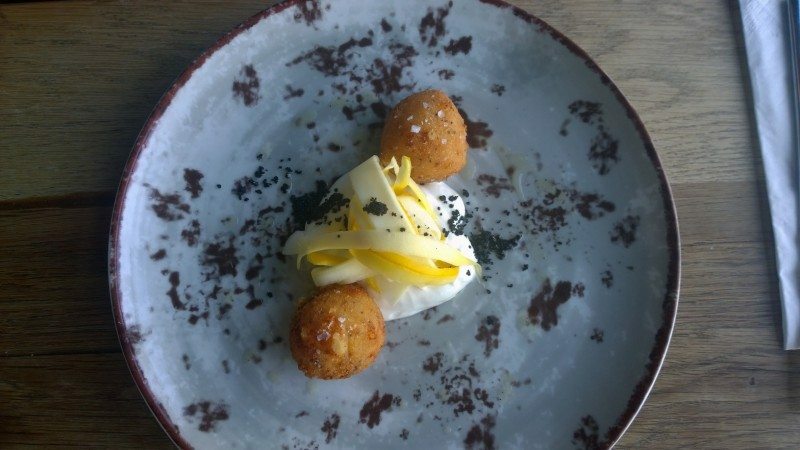 The food is outstanding, and great value for the quality, it’s at the higher end of the casual dining price range, but when you look at the precision and care that is put into each dish, the value is there.